Seafood restaurant with a view of the Galleria's bright lights below. 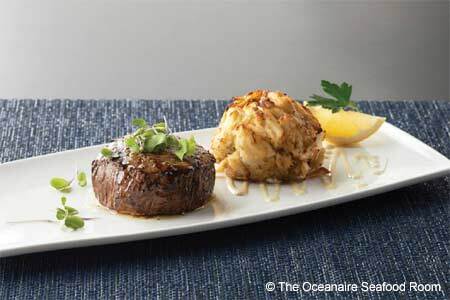 : The Oceanaire Seafood Room, boasting floor-to-ceiling windows overlooking the Galleria sights and the twinkling lights of Westheimer and Post Oak, creates signature seafood entrées within a nautically-themed scene reminiscent of it coast-to-coast outposts. Starters include mahi mahi, ahi and bivalves from the oyster bar. Fans of fin always find their way here during salmon season when the wild caught fish is featured prominently on the menu. You can depend on standard sides, too, such as the sour cream Yukon Gold mashed potatoes, and lobster and sweet corn risotto. An extensive wine list and a professional crew make for a pleasant night.